or stand at the 2019 fair? Want to help out at the fair as a fundraiser for your group? Sunday Gates open at 8 a.m. Seniors 60 & over, 1/2 price from 8 a.m.—6 p.m.
Sunday The gates will be FREE to the public beginning at 6 p.m. on Sunday evening. Come on up for Sunday dinner at the fair and pay no admission. Each day 8 a.m. – 10 p.m.
Wednesday 12 p.m. – 10 p.m.
Thurs. – Sat. 10 a.m. – 10 p.m.
Sunday 10 a.m. – 8 p.m.
Save when you buy advanced sale items in our Online Store! Advance sale items will not be available after 8:00 AM Wednesday August 7, 2019. Save $5 on admission! A Carver County Agricultural Society Membership costs $35 and includes 5 gate tickets. Advanced ride tickets available via 4-H club members or online. 10 rides for $20! The Carver County Fair Board of Directors has decided to discontinue Fair Bucks. Sorry, no Fair Bucks this year. We encourage you to take advantage of our Agricultural Society Membership and our Advanced Ride Ticket sales as substitutions. No parking passes sold to general public. Only commercial and livestock exhibitors can purchase parking passes. If entries and required registration are in the fair office by the deadline date, one fair-week-pass will be issued to each livestock exhibitor, but only one parking pass will be issued per residence/family exhibiting livestock. 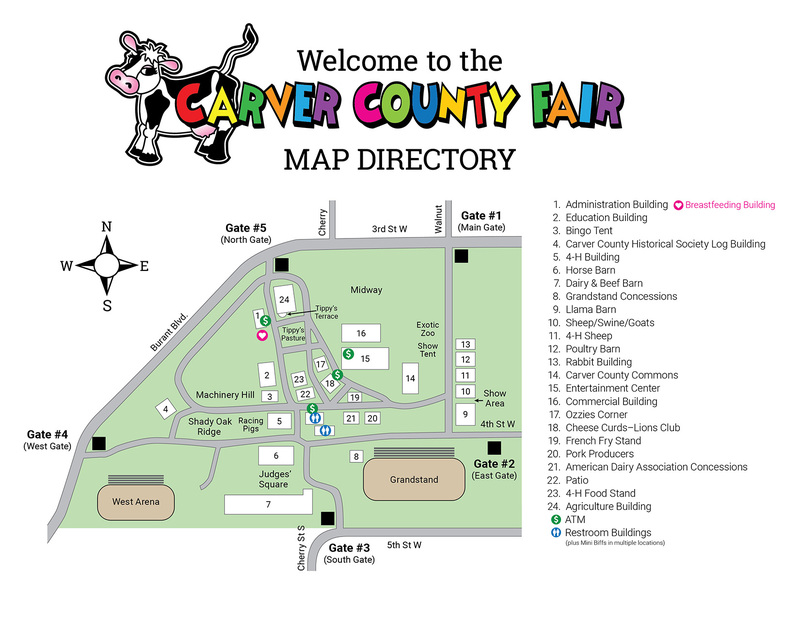 The Carver County Fair Board already issues each 4-H livestock exhibitor a pass via the Carver County Extension Office, no second pass will knowingly be issued to anyone. Public parking for the Carver County Fair is available on the city streets in Waconia. Public parking is not available on the Fairgrounds. Commercial and Livestock exhibitors are allowed to buy parking passes as part of the lease agreement with the Fairgrounds. Handicapped parking is located on Burandt Blvd. adjacent to the Main Gate. Exhibiting at the Carver County Fair is as easy as 1-2-3! 1. Decide what you want to exhibit. 3. Bring exhibits to fair. Pre-registration is strongly encouraged. If you pre-register, your entry tags will be ready when you bring in your exhibits and you will avoid long lines. Please visit the Exhibiting at the Fair page for more information. NO PETS ALLOWED IN FAIRGROUNDS. Only commercial and livestock exhibitors can purchase parking passes. Parking space for holders of parking passes is limited and no guarantee is given that parking will be available. No car passes sold to the general public. Re-Enter: Individuals must be wrist-banded for re-entry as they leave. No alcoholic beverages will be allowed in any other area of the fairgrounds except in the Entertainment Center and Grandstand. A breastfeeding tent is available on the east side of the Education Building. While the greatest care will be executed by the Management to protect patrons of the Carver County Fair, each individual will be held personally responsible for his or her actions, and the Management will not be accountable or responsible for any injury. The Carver County Agricultural Society Management assumes no liability for loss or damage to any property to the concessionaire, exhibitor or patron, due to theft, fire, tornado, weather conditions or other causes. The Directors of the Carver County Fair Board reserve the right to refuse any offensive or obscene exhibits or fair event participation in which the judgment of the Fair Board would be offensive to the general public. The Carver County Fairgrounds is private property. It is the expectation of the Carver County Fair Board that patrons will behave in an appropriate, lawful manner. No entrances or exits can be obstructed or limited in any way. The distribution of literature or other informational pieces must come from a commercial exhibitor space. If you would like to inquire about renting a space at the Fair, click here. © 2019 Carver County Fair. All Rights Reserved.